Individual style when given the proper attention is one in which we get a chance to experience a person's artistic nature and sense of self. In a world of so many stylish gents who are also hard workers, I feel it is important to often spotlight such men. Their style, character, gentry and ambitions all play a part in telling a story and inspiring others. The foundation of Dress Like A Gent ™ is built on showcasing various methods of not only dressing well, but also doing well and living well from the inside out. With this being said, I would like to introduce our readers to a phenomenal young dapper gent by the name of Donnay Ragland. I've chosen to feature this gentleman for his stellar style versatility and his current ventures. And the part that really stands out about Donnay beyond the obvious is the fact that he loves the Lord unashamedly! Me: Donnay, how would you describe your personal style? Donnay: If I could describe my personal style in two words I say versatile and spontaneous! 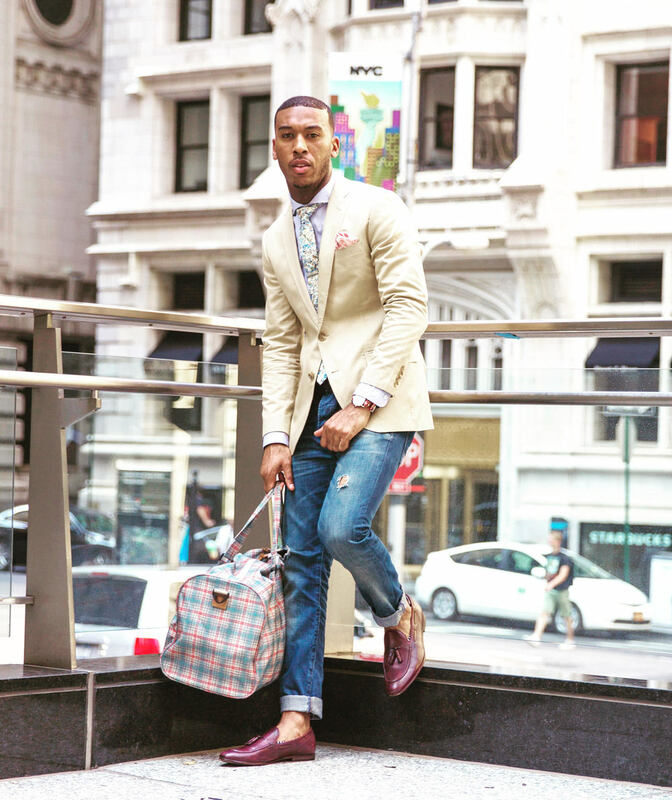 My style varies from street-inspired styles, to dapper /professional styles and sometimes a combination of both. Depending on the occasion or how I'm feeling determines my outfit choice for the day. If I want to dress comfortably, I would lean towards my street attire which always is stapled with a fresh pair of sneakers. If I'm feeling dapper for the day, I can pull out a nice tailored suit with a slim tie and pocket square to finish the look. When I want to be professional but not overly dressed, I do a mixture of street and professional attire which consist of a blazer, jeans and either dress shoes or casual sneakers. Me: What role do you feel your personal style plays in your work? Donnay: My personal styles plays a major part of who I am and what I enjoy most. I'm a people person so I enjoy talking to people or holding small conversations from time to time. My style usually sparks conversation with people especially my coworkers. " Your shoes are nice!" "I love your outfit!" "Is that a new coat you have on?" These are simple compliments that usually leads to short convos. How does this play a role in my work? Starting your day off with a short convo or a compliment usually kicks your day off in the right direction. I get to work with a positive attitude which transpires to a productive day with my duties at work. being well dressed also makes me feel good. Deon Sanders once said " If you look good, you feel good, then you play good." I live by this motto at work lol. Me: What or who inspired your stylishly? Donnay: Living in NY, the fashion hub, has inspired me to take my style to the next level. I get inspiration from just walking the streets of NY and seeing well-dressed fashionistas on a daily. I constantly take mental notes from others style to enhance my own. In addition, I love looking on Pinterest and Instagram for style inspiration. There are several bloggers and unique styles I run across on social media! Me: Please share with us some of your immediate goals in life and what specifically you are doing to achieve them. Donnay: I would love to become a personal stylist for professional athletes and a brand ambassador for a creative, versatile brand that's fitting to my personal style. Why professional athletes? I grew up playing sports my whole life all the way through college. As a former athlete, I believe I can easily relate to professional athletes, understanding the importance of upholding their image and personal brand on and off the playing field... What steps have I taken to achieve my goals? I'm currently in the fashion industry working at the J Crew corporate office. I want to continue to grow, develop, and learn as much as I can to help build my own brand eventually. I have started my fashion page on Instagram just a start and to showcase my talent and eye for fashion. With God as the center, I want to build a name for myself not elevate myself, but to use that platform to glorify the Father and help others along the way. I want to be able to style young high school boys that cant afford a suit for prom, and help young men find their identity through mentoring and styling.